In the March Annuals released on 3/29, Hanna-Barbera will be showcasing some new ideas for our Hanna-Barbera comics line with 8-page samplers of the new stories. Get ready for RUFF AND REDDY by writer/artist Howard Chaykin, THE JETSONS by writers Jimmy Palmiotti and Amanda Conner with art by Pier Brito, TOP CAT by writer Dan DiDio with art by Phil Winslade, and the already highly anticipated series SNAGGLEPUSS by writer Mark Russell with art by Howard Porter. Mark Russell recently revealed in an interview with HiLoBrow that his concept for Snagglepuss is as a Southern gothic playwright working with an ensemble cast of cultural figures, exploring an intensely creative time in the New York City theater scene of the 1950s. 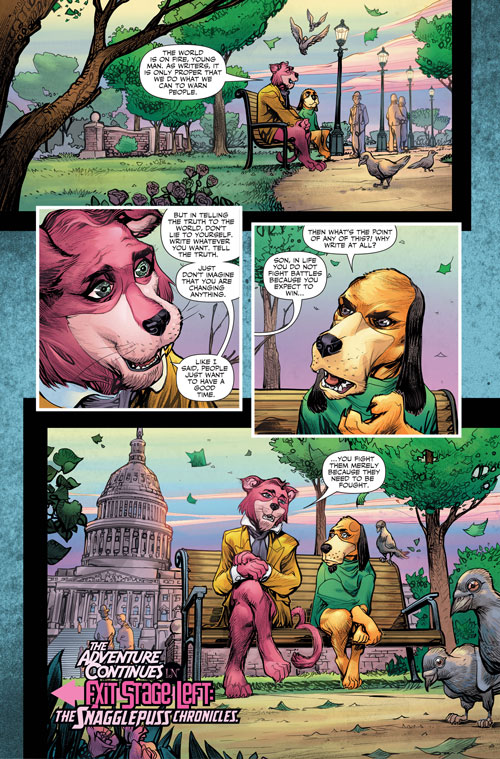 In Russell’s eight-pager, Snagglepuss faces the House Committee on Un-American Activities. 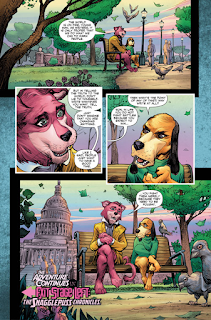 Stay tuned for the complete sampler, but enjoy a first look at SNAGGLEPUSS!